If you think that Eat Your Greens: The Surprising Power of Homegrown Leaf Crops is just a book telling you to eat your salad, you are in for a pleasant surprise. 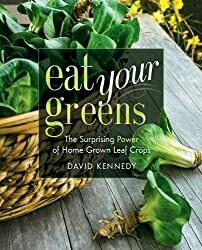 In fact, author David Kennedy makes a great case against the cultivation of head lettuce that is shipped all over North America. So, what kind of greens is he talking about in the title of his book? 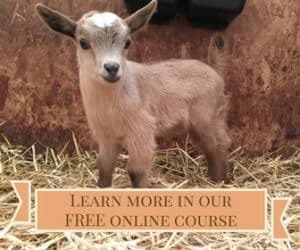 Although most of us know that we can eat the leaves of garlic and onion plants, and perhaps even beets, how many people eat the leaves of okra, radish, squash, and peppers? You can even eat many cover crops, such as alfalfa, although it is too tough and stringy to eat like lettuce. In addition to telling you what “greens” you can eat, David also gives advice on when and how to eat them. For example, the beautiful flower cockscomb has edible leaves that can be harvested before flowering. They are best steamed or boiled and then rinsed. 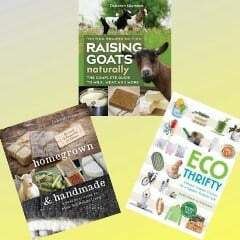 There is also a section on how to make leaf concentrate, which is a super nutritional alternative to meat protein. For example, 3.5 ounces of alfalfa leaf concentrate has 50.8 grams of protein, which beats a beef steak at only 29 grams of protein in the same-sized serving. The leaf concentrate also beats the steak in iron with 54 mg of iron compared to the steak, which has less than 2 grams. It also beats milk in terms of calcium at 3380 mg of calcium compared to milk at only 912 mg of calcium. In addition to providing a lot of great information about nutritious greens, David also explains how you can grow them year round, even in extremes of cold and heat. The book is rounded out with more than two dozen recipes, including sweet potato leaves salad, amaranth leaves with black beans, green pasta, and a green birthday cake. Also check out this interview with author David Kennedy and an excerpt from the book! I like to eat my greens, but I'm pretty boring in my variety and preparations. I'm allergic to some greens, though (lettuce and spinach), so having some new options would be helpful! Plus, I'd just enjoy trying some new ideas! I love greens! I've eaten radish greens, but did not know I could eat the ones on my pepper plants. Your review sure makes this book sound intriguing! My husband lifts weights and is always trying to get tons of protein. Not an issue during the spring and summer when the hens are laying eggs all over the place but during the winter it is more difficult to find natural protein. I found the leaf concentrate numbers interesting and look forward to finding out more.